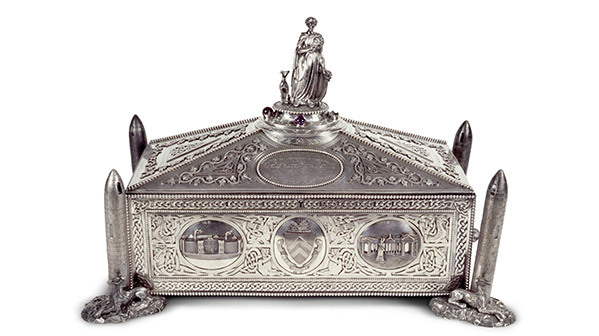 This ornate silver casket, with by now standard imagery of round towers, wolfhounds and ‘Celtic’ filigrees, and a representation of the former (and hoped-for future) Irish parliament, was presented by ‘the nationalists of Drogheda’ to Charles Stewart Parnell in 1884. He was then near the summit of his prestige as the ‘uncrowned king of Ireland’. Parnell was an unlikely leader of Irish nationalism. Born into a Protestant landowning family in Avondale, Co. Wicklow, and educated at Cambridge, he was nervous, superstitious and sometimes withdrawn. At his height, however, he was a brilliant political strategist. Within five years of election as Home Rule MP for Co. Meath in 1875, he had established control over the previously fractious Irish parliamentary party at Westminster and the extra-parliamentary Land League. To do so, he had to appeal to respectable middle-class nationalists, militant tenant farmers and physical-force republicans belonging to the Fenian secret society, which staged an abortive ‘rising’ in 1867. Parnell was a pragmatist who could hint effortlessly at revolutionary intent. His boldest stroke was to accept the presidency of the Land League, founded in Dublin in 1879 by Fenian gun-runner Michael Davitt. Its long-term demand was for tenants to become owners of the land; in the short-term it focused on the ‘three Fs’: fair rents, free sale and fixity of tenure. Its tactics became increasingly militant: rent strikes, physical impeding of evictions, mass meetings and, its signature tactic, the boycott, a term coined to describe the organised ostracism of Mayo land agent Captain Hugh Boycott in 1880. Parnell fused these tactics with an obstructionist campaign at Westminster, to keep the Irish land question near the top of the British political agenda. His triumph was the 1881 Land Act, which granted the three Fs and established a land commission with powers to set rents and make loans to tenants wishing to purchase their holdings. It was the first in a series of acts (1885, 1891 and 1903) that gradually accomplished a momentous social change—the transfer of the vast bulk of Irish land from landlords to peasant proprietors. After the first land act Parnell shifted his focus to Home Rule—autonomy for Ireland within the empire. When he led 86 Home Rule MPs to Westminster in 1885, gaining the balance of power, he cemented an alliance with Prime Minister William Gladstone. He now had a formidable alliance for Home Rule, from the Catholic bishops to the Liberal Party. In 1886 a Home Rule bill was defeated in the House of Commons, but only by 30 votes. From this zenith, Parnell’s power declined. Poor health and a long-term affair with Katherine O’Shea, wife of one of his more disreputable MPs, diverted his energies. He briefly regained his heroic status in 1890, because of a failed smear campaign linking him to secret support for rural crime. He was then cited by O’Shea’s husband in a divorce petition and lost the support of the Catholic bishops. The party split bitterly; Parnell died in Brighton in 1891, aged just 45.